Nvidia took the wraps off its new Parker SoC at the Hot Chips symposium in Cupertino yesterday. The headline purpose Parker is as a next-gen mobile processor designed to "power the next generation of autonomous vehicles". Thus it will be found in upcoming deep learning-based self-driving AI cockpit systems. 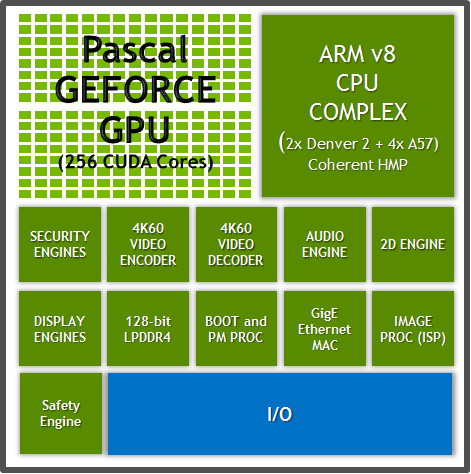 With its combination of Pascal GPU and Nvidia Denver CPU architecture Parker can efficiently deliver up to 1.5 teraflops. 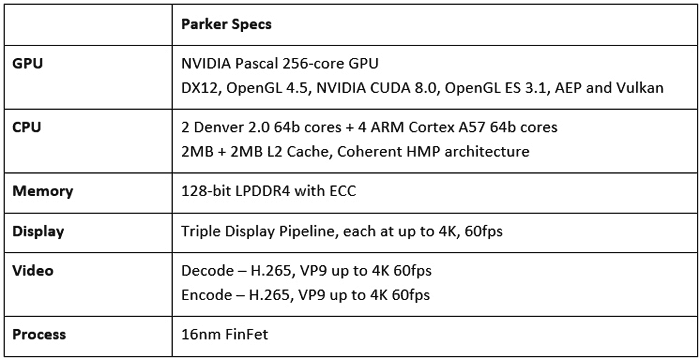 Parker is equipped with "a new 256-core Pascal GPU" which offers both fast, fluid graphics for multiple in car displays and fast deep learning processing power. 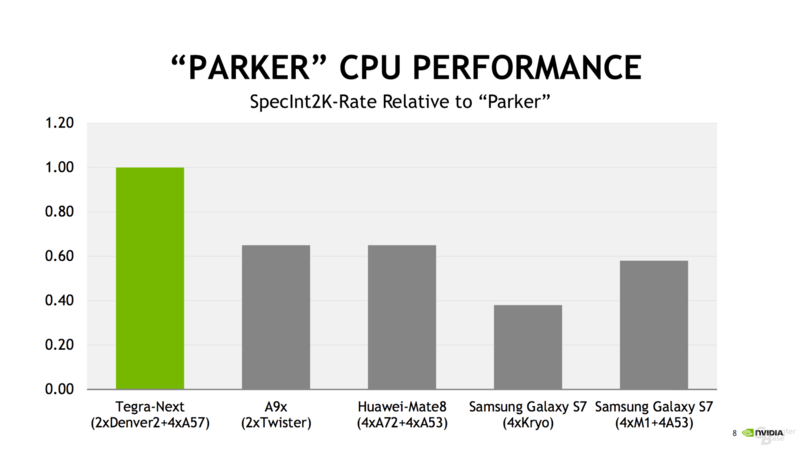 For CPU power Parker uses a complex of two next-generation 64-bit Denver CPU cores (Denver 2.0) paired with four 64-bit ARM Cortex A57 CPUs. Working together in a fully coherent heterogeneous multi-processor configuration, these CPUs are said to deliver "50 to 100 percent higher multi-core CPU performance" than other mobile processors. As you can see in the block diagram, above, among its components the Parker SoC includes a Safety Engine, always monitoring for faults and errors. Additionally, Parker's support for decode and encode of video streams, up to 4K resolution at 60 frames per second, helps automakers employ the highest resolution video cameras for object detection. The 4K graphics capabilities can equally be used for in-car displays / entertainment. Automakers can take advantage of the scalability offered by Parker, using a single unit for simple efficient systems or using a system like the Nvidia DRIVE PX2 with a pair of Parker chips and two discrete Pascal GPU cores. Furthermore, Parker's hardware-enabled virtualization supports up to eight virtual machines for in-car systems to simultaneously run multiple systems in different parts of the car. Possibly the only really interesting CPU design out there atm, more details please if you can get them. I hope they have a different version coming without the car based stuff, for say a rev2.0 of the Shield TV. I want to see TWO of these chips in the next rev, along with a large fan (of course box that resembles xbox1 size) for far higher clocks, etc. I'm more than willing to pay $300-350 for a powerful android box, especially if it can multi-boot to other OS (linux/steamOS maybe?). Still waiting for an announcement of steamOS for ARM (get with it NV). I'd be super stoked if the box had a slot for a PCIE gpu later+spot for a 2nd HD (or SSD) later ;) Maybe they can just take chips from the one here that have failed security stuff or something or maybe the security engine/safety engine take so little space it doesn't matter. Since Nintendo's unit is a tablet/handheld deal, no reason for NV to not up the ante on REV2.0 Shield TV boxes. I like the current model, but I want to see that on steroids before I buy :) Rev2 should be a FAR more capable box to woo more people. You can still sell a cheapo model (128GB SSD or something? ), but make sure ALL are upgradable. PCIE gpu isn't a must for me, but I better be able to stick in a 2nd drive and hook an external bluray to it so I can quit buying new bluray players…LOL. They need to certify a few models so people know what to buy to get the bluray part done or sell a model at cost that works? Whatever. If you want to increase sales, offer more value. I hope they have a different version coming without the car based stuff, for say a rev2.0 of the Shield TV. That would be 1.5 16-bit TFLOPS, and ~750 GFLOPS in normal GPU terms. That's assuming that this Tegra GPU runs at around 1500 MHz as well. I wonder if they will actually enable the A57s in this design - they were never enabled in the previous Tegra due to a design fault.